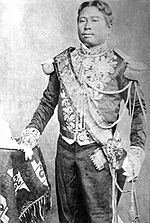 ក្នុងសម័យកាល គ.ស. ២៤៥-២៥០ ពួកអ្នកមានបណ្ដាសក្ដិយសនៃនគរអ៊ូខាងកើតរបស់ចិនបានមកទស្សនកិច្ចទីក្រុងហ៊្វូណានវ្យាធបុរៈ។In the period 245-250 C.E. dignitaries of the Chinese Kingdom of Wu visited the Funan city Vyadharapura. ពួកបេសកជន ខាងថៃ និង ជូយីងបានបញ្ជាក់ថាភ្វូណាន ខណៈនោះមានវប្បធម៌ព្រហ្មញ្ញដោយឡែកពីគេ។Envoys Kang Tai and Zhu Ying defined Funan as to be a distinct Hindu culture. ពាណិជ្ជកម្មជាមួយចិនបានចាប់ផ្ដើមក្រោយពីការវាតទីរាជវង្សថាងឆ្ពោះមកខាងត្បូង ប្រហែលមគ.សតវត្សទី២។Trade with China had begun after the southward expansion of the Han Dynasty, around the 2nd century B.C. Effectively Funan "controlled strategic land routes in addition to coastal areas" and occupied a prominent position as an "economic and administrative hub" between The Indian ocean trade network and China, collectively known as the Maritime Silk Road. Trade routes, that eventually ended in distant Rome are corroborated by Roman and Persian coins and artefacts, unearthed at archaeological sites of 2nd and 3rd century settlements. The question of how Funan came to an end is in the face of almost universal scholarly conflict impossible to pin down. Chenla is the name of Funan's successor in Chinese annals, first appearing in 616/617 C.E. [ចាប់]ពីថ្ងៃ ៤ តុលា ១៩៦៥ ដល់ ១៥ សីហា ១៩៧៣ សហរដ្ឋបានទម្លាក់គ្រាប់យុទ្ធភណ្ឌចម្ងាយឆ្ងាយបន្ថែមទៀតលើកម្ពុជាច្រើនជាងកាលពីមុន​ដែលគេគិតថា: ២៧៥៦៩៤១ តោន បានទម្លាក់ជាង ២៣០៥១៦ ជើង លើទីកន្លែង ១១៣៧១៦ កន្លែង។ មានត្រឹមតែការទម្លាក់គ្រាប់បែកជាង ១០ ភាគរយ ប៉ុណ្ណោះមិនរើសគោលដៅដែលក្នុងនោះមាន ៣៥៨០ កន្លែង បានចុះបញ្ជីថាជាគោលដៅមិនស្គាល់ និង ៨២៣៨ កន្លែង ផ្សេងៗទៀតគ្មានគោលដៅចុះបញ្ជីអ្វីទាំងអស់។ . . . "កិច្ចសរុបការទម្លាក់គ្រាប់បែកកំឡុងប៉ុន្មានឆ្នាំនេះ ស្ទើរតែជិតប្រាំដងច្រើនជាងតួលេខដែលគេទទួលយកបានជាសកល។ សរុបទៅចំនួន ២៧៥៦៩៤១ តោន ដោយពិនិត្យឃើញជាប្រយោល ពួកសម្ព័ន្ធមិត្តបានទម្លាក់គ្រាប់បែកជាង ២ លានតោន កំឡុងពេលសង្គ្រាមលោកលើកទី២ទាំងមូល រួមមានគ្រាប់បែកដែលបានវាយប្រហារហ៊ីរ៉ូឝ៊ិម៉ាក់ និង ណាហ្គាសសាកគិ: ១៥០០០ និង ២០០០០ តោន ដោយឡែកៗ។ កម្ពុជាជាក់ស្ដែងទំនងជាប្រទេសដែលត្រូវបានគេទម្លាក់គ្រាប់បែក​ធ្ងន់ធ្ងរបំផុតក្នុងប្រវត្តិសាស្ត្រ។ . . . [ការ]ទម្លាក់គ្រាប់បែកបានបង្ខំឱ្យពួកកុម្មុយនិស្តយួនចូលកម្ពុជាកាន់តែជ្រៅទៅៗ នាំឱ្យពួកគេមានទំនាក់ទំនងកាន់តែល្អជាមួយពួកកុបករខ្មែរក្រហម . . . [និង]បានជំរុញប្រជាជនខ្មែរសាមញ្ញឱ្យចូលទៅក្នុងកងប្រដាប់អាវុធនៃពួកខ្មែរក្រហម ដែលជាក្រុមមួយដើមឡើយហាក់បីដូចជាមានក្ដីសង្ឃឹមតិចតួចចំពោះ​ការនឹងទទួលជោគជ័យនៃបដិវត្តន៍របស់ខ្លួន។"
"នៅពេលសមាជ នៅរដូវក្ដៅ ១៩៧៣ បានអនុម័តច្បាប់បញ្ចប់សកម្មភាពយោធាស.រ. ក្នុង លើ រឺ នៅក្រៅឆ្នេរឥណ្ឌូចិន ហើយសកម្មភាពយោធាស.រ. ដែលកំពុងបន្តគឺជាការជួយពីលើអាកាសដល់រដ្ឋាភិបាលនិងកងទ័ព​កម្ពុជាជាមិត្ត​ដែលគ្មានសង្ឃឹមការពារប្រទេសពីវៀតណាមខាងជើងនិងការប្រយុទ្ធតទល់នឹង​ខ្មែរក្រហម...​អ្វីដែលធ្វើឱ្យមានភាពចលាចលដល់កម្ពុជាគឺជាការកាន់កាប់របស់​វៀតណាមខាងជើងនូវចម្រៀក​ដ៏ធំនៃទឹកដីកម្ពុជា​តាំងពីឆ្នាំ ១៩៦៥ រហូតមក​ដោយការប្រើទឹកដីទាំងនោះជាមូលដ្ឋានយោធាក្នុងគោលបំណងចាប់ផ្ដើមការវាយប្រហារលើកងកម្លាំងស.រ.​និងវៀតណាមខាងត្បូង​នៅឯទឹកដីវៀតណាមខាងត្បូង។ មេដឹកនាំកម្ពុជាសម្ដេចសីហនុបានត្អូញត្អែរយ៉ាងខ្លាំងដល់ពួកយើងអំពី​មូលដ្ឋានទ័ពវៀតណាមខាងជើង​នៅក្នុងប្រទេសរបស់ទ្រង់ និងបានសុំឱ្យពួកយើងវាយលុកមូលដ្ឋានទ័ពទាំងនោះ (ដែលក្នុងនោះពួកយើងបានចាប់ផ្ដើមធ្វើពីលើអាកាសនៅឆ្នាំ ១៩៦៩-៧០)។ ក្រោយមកក៏ជំរុញឱ្យមានការប៉ុនប៉ងរបស់វៀតណាមខាងជើងលុកលុយរាតត្បាតប្រទេសនេះទាំងមូលកំឡុងខែមីនា-មេសា ឆ្នាំ១៩៧០ ដោយហេតុតែកងកម្លាំងស.រ. និង វៀតណាមខាងជើងបានតទល់គ្នាតាមរយៈការលុកលុយលើដីគោក​គួរឱ្យកត់សំគាល់នៅចុងខែមេសា...បានបង្កជាផលវិបាកនៅឥណ្ឌូចិនដែលមិនត្រូវបានគេគិតស្មានដល់​ជាមុនឡើយ។ សមាជបានសម្រេចជាចុងក្រោយ យ៉ាងណាមិញ ក៏នៅ រវាងឆ្នាំ ១៩៧៣ និង ១៩៧៥ ដែរ។"
↑ Percival Spear, India: A Modern History (University of Michigan Press: Ann Arbor, 1961) p. 14. ↑ David Chandler, A History of Cambodia (Westview Publishers: Boulder Colorado, 2008) p. 39. ↑ Philip Short, Pol Pot: Anatomy of a Nightmare (Henry Holt & Co.: New York, 2004) p. 195. ↑ Philip Short, Pol Pot: Anatomy of a Nightmare (Henry Holt & Co.: New York, 2004) p. 204. ↑ Philip Short, Pol Pot: Anatomy of a Nightmare p. 4. ↑ Rodman, Peter, Returning to Cambodia, Brookings Institute, August 23, 2007. ↑ Bezlova, Antoaneta, China haunted by Khmer Rouge links, Asia Times, Feb 21, 2009. ↑ US Department of State. Country Profile of Cambodia.. Retrieved July 26, 2006.